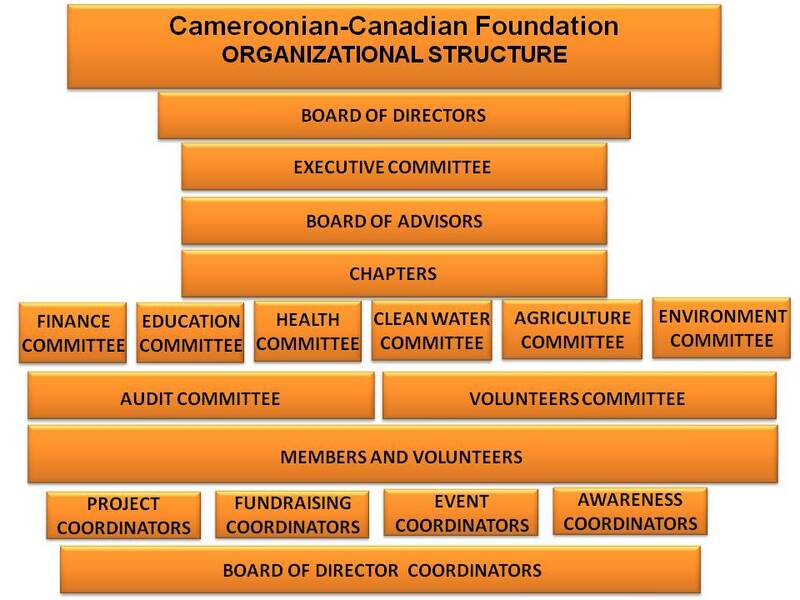 The Cameroonian-Canadian Foundation currently has 4 Board Directors, Executive Committee (1 Chair, 1 Vice-Chair, 1 Treasurer, and 1 Secretary General) and 4 Board Advisors. We also have Finance, Health, Education, Languages, Scholarship, Grants/Fundraising, Awareness, Relieving, Agriculture Committees in place. Other committees listed will be populated as interested members, volunteers and candidates are recommended or come forward to serve. We firmly believe that with the proposed structure, our members, volunteers, donors, and partners can easily understand our governance model and assess our strength, leadership, accountability and decision-making capacity as an organization.